The connection between fatigue and productivity is explored every now and then. In the consumer oriented society, it is only natural for the companies to be interested in their workers’ well-being, since it often reflects on the productivity. The latest trends in business research are trying to find out whether sedentary or standing jobs are causing more fatigue, and what the possible solutions are. Let’s first start off with some facts about the jobs which are typically done from a standing position. These are usually assembly-line workers, machine operators, salespeople, and many others. The occupations involve working while standing on a hard surface, eventually leading to fatigue, and even major health issues. It has been proved the symptoms of exhaustion appear 90 minutes after beginning work, while a decrease in concentration was recorded after a mere 50 minutes. Another study on standing fatigue revealed that some of us get tired after standing up for less than 60 minutes. But this is for good reason. In some instances, there are health hazards associated with standing in an incorrect position. On the other side, we have sedentary jobs, which are also far from perfect. While workers from the previous category long for a chair, office workers are constantly complaining about being chained to the desk. Even though it’s just a figure of speech and they can move freely, too often is an employee burdened with the workload to concentrate on anything else but sitting at the desk and typing. Mental fatigue is just as problematic as the physical one. Actually, it causes you to underperform physically, even outside of the workplace. We’ve all noticed after sitting all day in the cubicle, we are barely able to do anything else but sit on the sofa. Somewhat surprisingly, sitting for hours isn’t a quality of a perfect job. A study showed that transit drivers are twice as likely to get heart disease when compared to guards or conductors, for instance. Dementia, a shorter lifespan, deep vein thrombosis (DVT), and diabetes are only a few conditions one can expect unless they pay extra attention to the health. Needless to say, both types of fatigue influence the workers’ productivity, and, consequently, the company’s financial report. For example, 24% of the overall sick leave in the UK was due to musculoskeletal conditions, making it the biggest contributor. Naturally, the employers are wondering what could be done to help their workforce. When it comes to standing in static positions, a solution appeared in the form of anti-fatigue mats. They are supposed to provide insulation against cold floors, stimulate the muscles, prevent joint stiffness, reduce lower back pain, and minimize the risk of slipping. However, this goes only for quality anti-fatigue mats. As for the sedentary jobs, sit-stand desks seemed to become a real hit after a research was published that the employees using them were 46% more productive. However, it turned out the research was conducted in only one company, so it’s far from unbiased. Actually, while some are giving these workstations all the praise, others criticize them for causing deterioration in task-performing. So, what is a concerned employer to do? Fortunately, there is one fully reliable way of increasing the employees’ efficiency. 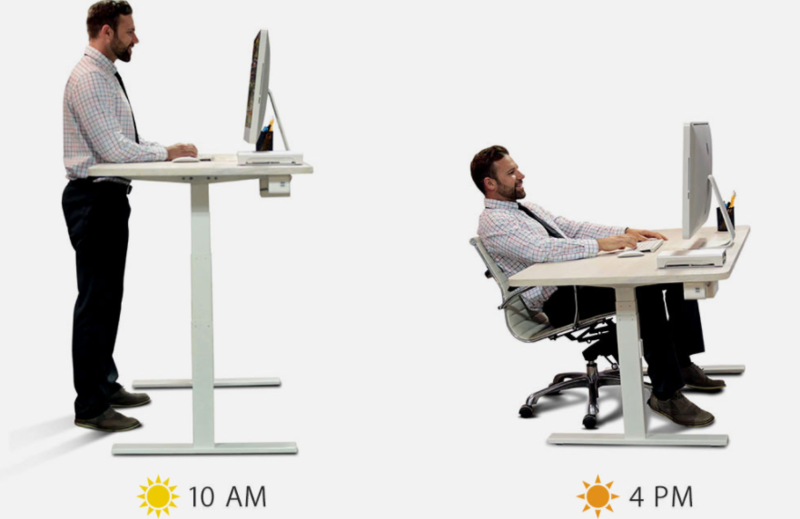 It’s been reported that this way boosts productivity by 38%. It’s actually so simple, just like the other vital things in life. All it takes for workers to be more engaged at their job is a sign from their company that they do care about them. It can easily be achieved through introducing anti-fatigue mats or buying a couple of adjustable height workstations; whichever is suitable for the business. In the end, a happy worker is a productive worker. Simple as that.